Saturday morning, activist Bree Newsome climbed a flagpole outside the South Carolina capitol building and took down the confederate flag capping a week of hot debate and fast movement towards removing the symbol of southern aggression from official state buildings. Sadly, the flag is flying over the capital yet again, reminding us that symbols are only as powerful–or weak–as the acceptance of the ideologies they represent. Removing the flags that celebrate America’s racist past will not eradicate the racist ideology that radicalized Dylan roof any more than removing a label from a can will vaporize what is inside. 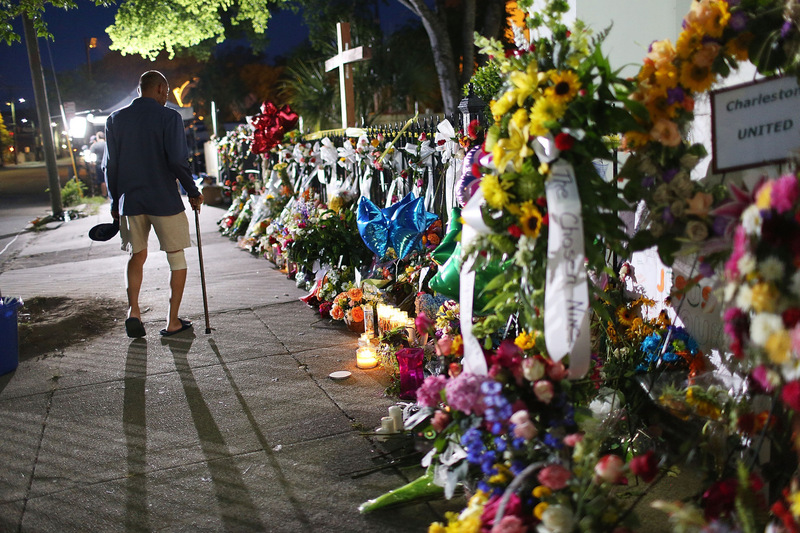 Even as the President eulogizes the most recent victims of racism, the war rages on– arson, death and defense of the killer continue unchecked–and unexamined in the mainstream media. Instead, the flag has taken center stage in the discussion of the Charleston Massacre. A quick google trends search shows that the focus is squarely on the flag, not the victims, nor the ideology that sparked the killing. You’ll recall the flag furor kicked up when killer Dylan Roof displayed one on his website. But while mainstream news has focused on the flag, the actual hate groups that pushed their racist filth on the internet, and whom Roof points to in his own radicalization continue to operate. 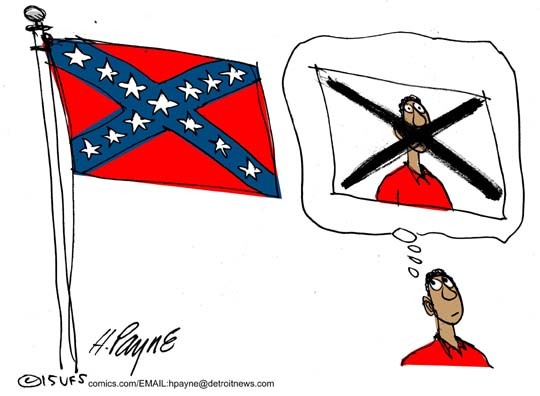 The presidential candidates who have taken money from Council of Conservative Citizens and other racist hate groups get an easy pass for their support of the flag’s removal without addressing their own past ties to hate activists. There was no critical questioning of candidates ties to these group son the Sunday talk circuit, but plenty of flag not-waving. Assuring us that there’s more than one hateful racist willing to perpetrate violence, six predominately black churches have burned in a string of arson stretching from Macon to Tallahassee. Ongoing investigations will identify perpetrators where they can, but the echo of the 1960’s replete with racially motivated murders and overt attacks on the black community via the black church sound in ears still ringing with this week’s gun shots. Mainstream media has all but ignored this string of violence in favor of the simply packaged story of the flag which looks to be moving toward a happy ending–audiences love a happy ending! Two children lost their lives in the course of a police chase in Detroit–a chase that had been called off by commanders concerned about the danger to the public just moments before the deaths. Gunshots, rough rides and speeding vehicles all resulting in dead black bodies still happen daily, leaving the black community decimated emotionally, socially and politically. The flags that flies over Ferguson, baltimore and Detroit are all American, and the struggle for justice continues in all those cities. Lets also not forget that Dylan Roof is not an old racist–he is a young racist, a millennial–from that generation that is supposed to mark the end of racism. The flag may be a worn out symbol, one long past its prime. Bu the perpetrator is merely 21–a man born in the heyday of hip Hop, and only 13 when Obama was elected–so squarely a member of new school racism, a racism proving just as deadly as old school. Racism won’t just die with the rise of the millennials–education is still key in stopping the spread of racism to yet another American generation. The flag needs to come down. Removing this symbol from state grounds is important, yes, and long overdue. But more important than the flag is the ideology that the flag represents–that was what radicalized terrorist Dylann Roof and emboldened others to burn down churches or commit one of hundreds of thousands of hate crimes that happen each year. Attacking the overt labels of racism is important. But we’re going to have to open our can of worms racism and deal with it if we are ever to reach a place free from racism and its violent devotees. Celebrate the small victories in this week filled with funerals, but stay conscious, stay activated and never settle for taking down the flags of the fathers without addressing the sins of their sons. But… I find there’s another question to ask (of course we don’t know if the NORC folks asked any other survey questions at the time they collected this data), and that is simply, “Why?” Why would such a seemingly large number of white folks have the impression that black folks are lazier? Let’s go back even further… to the crux of it all. What would make a white person hate a black person? On the surface it seems a very simple question. While you might be able to assign a relatively pointed answer as being some whites of the 1800’s, with sour grapes over loosing the Civil War, simply decided take it out on all the freed slaves of the day. I dunno if that explains the “why” for current racism or not. I believe by your own acknowledgement racism is acquired and not inbred, so there must be a “why” for all this. 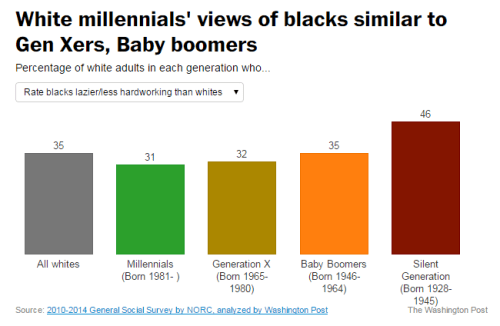 Whether it’s Boomers, GenX’ers, Millennials, someone.. or some thing.. is passing on this “why” for thinking black folks are lazier than white folks… or even racial hatred in general. Not only that, if it’s being passed on in some form what is making a third of white folks sign on to the belief? Hey, if you’ve been a parent, try telling your kids to do anything and they will just ignore you! Anyway… figure out the “why” of it all and maybe there’s something in there to make things better. I would think the why is white supremacy – thinking white people are better than everyone else. A thinking that is ingrained in our education system, judicial system and all the institutional systems we have. Um… I don’t recall being taught in school that white people are supreme.. or in control.. or should dominate. Hell, I was raised in the Chicago Public School System of the 50’s and 60’s.and you couldn’t get any more conservative than that. Maybe I was out sick that day? The curriculum itself teaches that without actually saying it. For example, there is no black history except for slavery. Histories of people other than white are shown as others. Reading lists typically only contain the thoughts of white men even though there are typically other thoughts at the time which are just as valuable. There is a significant lack of ethnic minority academics and studies have shown the reason for this is because the system works against them in becoming professors. Or maybe this is all problems in the UK and not a problem in America…? A book I suggest you read to understand the issues more and how they because the way they are is Learning to Divid the world by John Willinsky. You bring up an interesting point suggesting maybe that racism in the UK is somehow different than in the US. I have to assume that any difference that crosses political borders, especially the origins, are as diverse as anything else we humans do. But you know, if there’s a perception of education not being all inclusive of black thoughts and deeds then one also has to include all other racial divides…. Asian (especially in the 19th century in the US), Mexican, Hispanic… it’s not just black folks. Yes, In the UK, in the student movement, it is common to use the term Black in the political sense to include all people of colour. So in my comment I, wrongly, assumed you would understand by just highlighting black thoughts it would also incorporate all marginalised groups. The racism in the UK is definitely different to that in the US – our histories and structures are different. I think it was Mr. Churchill who once said that the British and Americans are the same peoples separated by a common language. 🙂 I certainly can’t speak about British forms of racism, historically or currently being practiced. But I do have some idea of human nature and behavioral development, which are universal. Ok.. so everyone has a list of reasons for white supremacy no matter how you define it. Does anyone have any ideas for change? That’s MY whole point. Just pointing fingers at white people or white supremacy or whatever connotation you want to give racism won’t work without a plan of action. It has to be more than just “white people have to learn…” or “white people have to change…” or “white people have to step up…”. I don’t see all this as totally a white person problem. Thanks for the reference site. Nice intellectual way of explaining it all but I think we can put all 8 reasons into something more simple. A) There were, in history, more white people than people of other skin tones, hence “whiteness”, in whatever context that means, would tend to dominate life. B) European whiteness became the center of it all out of a natural evolutionary development in culture and the physical sciences… and most importantly, spoken and written language. If the African tribes, native Americans, Austraiian Aborigines, etc. had evolved a written language I am sure we’d not be having this discussion. Ok I am going to stop this conversation because both you A and B are in fact incorrect and I can see I do not have the energy to correct you. Wishing you all the best! The why is political, economic, hegemonic. You are correct that understanding the roots is key–but I maintain the roots are not personal animus but cultural control. People belive messages that permeate the world they are a part of, not just from mom and dad. Prevailing narratives benefit people in power seeking to maintain it. Follow thr money. For me the last week or so has been both disturbing and euphoric. The killing at the church, breaks my heart. It reminds me that some of my closest friends are not safe: on the streets, in their homes, or even in their house of worship. On the other side is the US Supreme ourtrulingon marriage equity, for sure a highlight of the year for many of my friends. I agree with you, the idology needs to be changed. Education should play an important role in changing how people think, but education is a challenge also. Peaceful activism is also important, riots detract andadd fuel to the fire of hate.